I'm really trying to write down my knitting patterns as I go but I find it really hard to be totally happy with them. I so want to be able to communicate clearly with someone how to make the pattern - but we all think/work so differently - I worry that my directions will frustrate or confuse. 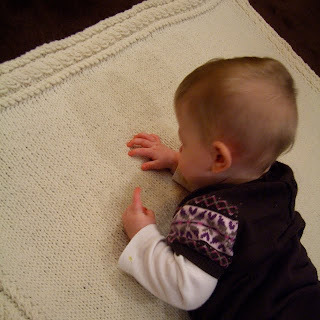 Baby bunny has lots of new mobility skills (she has taken to rolling around everywhere and recently learnt to pull up.) I find my eyes have to be glued to her at all times so she doesn't find her way into the dogs toys (yum) or pulls anything off a table that land on her head (ouch). I have been finding that knitting is an easy thing for me to pick up and put down quickly. (Every peaceful moment is now a crafting moment.) Here she is inspecting my stitches. 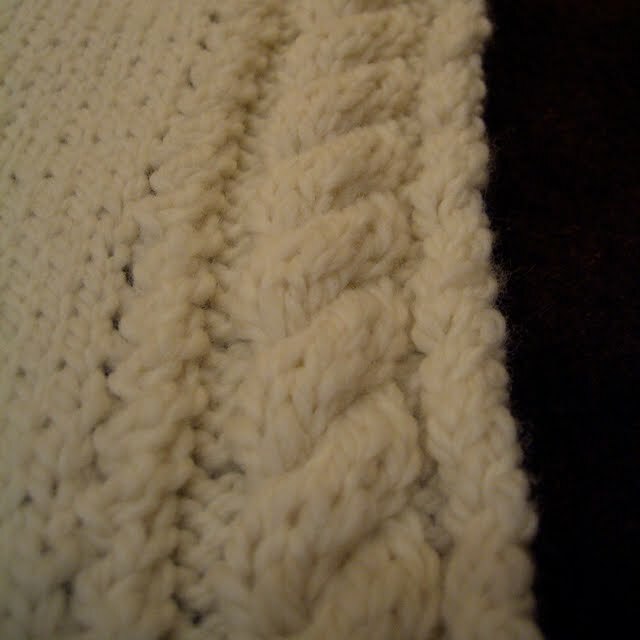 The border on this blanket is made using a a simple cable pattern. 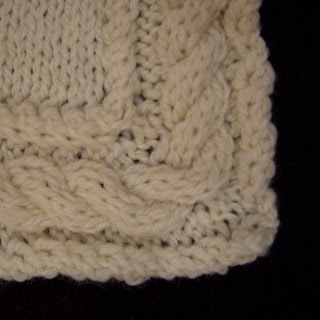 I joined the border to the blanket by knitting into stitches along the sides of the blanket and I joined the two ends of the border together using the three needle bind off technique.The same principle can be used with any pattern you care to use for a border. And the bonus is - no sewing is required! Do you like my fancy corners? That is a very pretty border. I'm always looking for new interesting borders and I really admire your corners. I think the main reason I knit so much is that it so mobile and easy to do with kiddos around. Portable and small seems to be the most crafting I can do sometimes with the little ones around. That is a wonderful blanket. Love your border and the corner is amazing. Your baby bunny is growing quickly. Enjoy your knitting time when you can! Very impressed indeed! No way I could do that, looks way too complicated!! It is a really great boarder, i've not hear of a three needle bind off, so am about to go and learn. I do like your corners, and I LOVE both cable and three needle cast off! 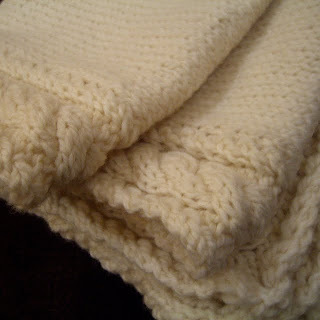 Your knitting work is exquisite Rachael - goodness it's easy on the eye! As is your gorgeous little tot. It's so exciting to hear about her new adventures - rolling around? Sheesh - she'll be walking next! All gorgeous, including baby bunny! Knitting is such an easy thing to transport. I had a mum talk about how she'd spent the whole day watching her kids do gymnatics and I repiled, Wow what a great knitting opportunity. She looked at me blankly, not being a knitter. I love the corners on this blanket would you be willing to share this technique with me? I can't find instructions on it anywhere! I'm happy to share the pattern when it is ready Karma - can you send me your e-mail? I will post on the blog soon. I'd love to get your tips on doing the corners of the 3 cable edging. Do you increment or decrement stitches or just block like crazy? Looks so professional! In my search to learn how to turn the corner with a continuous cable borde. After trying various miter corner methods turning the corner, I found the photo of your cable edge. I do admire your corners! Can you share how the stitches are done? 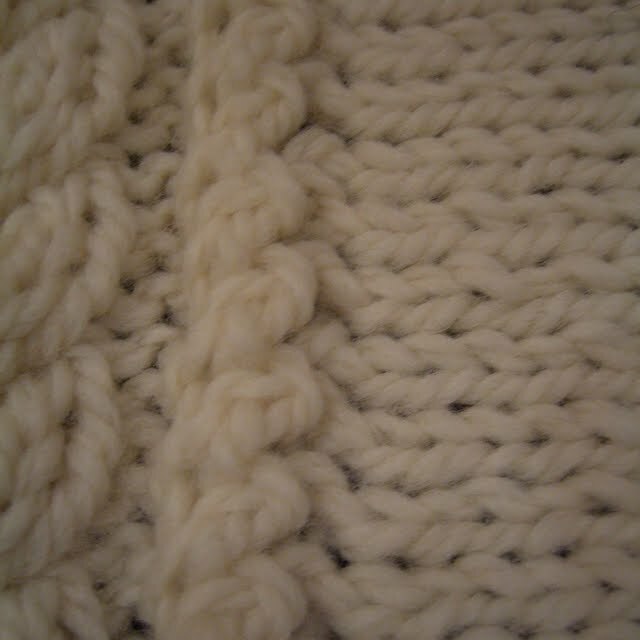 The mitered approach loses the cable pattern and the corner is misshapened. I haven't found a pattern that gives the stitches. After 7 tries I'm unable to proceed with the border. Any help would be greatly appreciated. Thanks.